Lawmaking is a religious exercise, and government is a God-ordained institution. Yes, I know Jefferson wrote a letter to the Danbury Baptists and referred to separation of church and state. And properly understood, I agree; I certainly don’t want this government or any other government running the church. But laws are rooted in morality, and moral convictions are based on religious beliefs. The time has come for Christians to rise up and demand that government adhere to the limitations imposed upon it by the American people when their delegates drafted the United States Constitution. 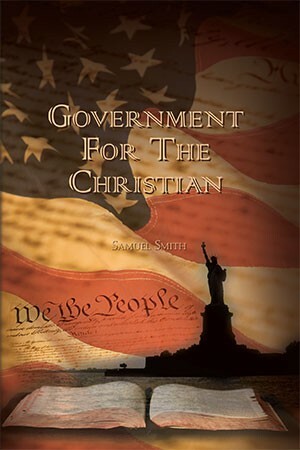 And in Government for the Christian, Samuel Smith has shown us how to think, speak, and act Biblically on behalf of our nation. This is an eBook. When you purchase it, you will be able to login to the store and download the martin_govbook.zip file. Unzip it and it contains both the ePub and Mobi files for your eReader. E-books are protected by the same copyright as books; their content is protected by law. Sending the files of e-books to family, friends, etc. is against the law, as is posting the e-book to your blog, Facebook, or other social networking page. You have permission to download each purchased e-book from this site three times so you can have it on your personal computer, e-reader, iPad, phone, etc. No part of these resources may be copied or stored in a retrieval system or transmitted in any form by any means: electronic, mechanical, recording or otherwise (except as permitted here), without written permission from Biblical Discipleship Ministries.